An email will be sent to members highlighting the major changes of our bylaws and vote to approve or oppose the changes. The current bylaws, proposed bylaws, current policies and updated policies are linked below for reference. We are happy to report that ATDSFL recently received a letter from ATD President Tony Bingham congratulating the chapter for successfully meeting all 18 Chapter Affiliation Requirements (CARE) for 2015. 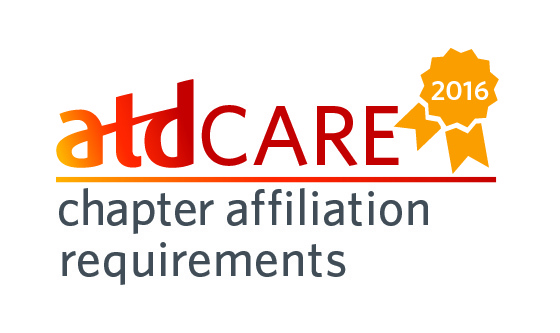 CARE is designed to ensure partnership, communication, and collaboration between chapters and ATD with the goal of providing support to chapters and enhancing the member experience. Membership Super Star status is achieved by having joint membership over 45 percent. Measuring those who belong to both ATD and the South Florida Chapter is a key component of CARE, and we are proud to be recognized for going above and beyond. Click here to read Tony Bingham's letter.